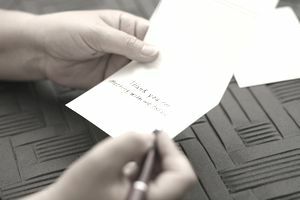 If someone does you a favor – anything from buying your product to helping you get an appointment with a decision maker – then a thank-you note is not only appropriate, it will also help you to maintain the relationship with the helpful person. Developing a regular thank-you note habit can yield impressive results. Joe Girard, the world's greatest salesperson according to the Guinness Book of World Records, credits his success to his habit of sending handwritten cards every month to every one of his customers. Girard sent out over 16,000 cards per month, and as a result, he became the top car salesperson in the world for 12 years in a row, but you don't necessarily need to send thousands of cards every month to achieve an impressive result. Don't think that sending out an email or a form letter will accomplish the same thing. The fact that so few people bother to send out handwritten letters and cards will make yours far more powerful. People notice handwritten letters whereas they tend to toss form letters straight into the recycling bin. Such letters don't need to be long, either. Girard's famous handwritten cards said simply, “I like you.” It was the fact that he bothered to send those cards every month that impressed his customers, not fancy or complicated messaging. A thank-you note is a particularly powerful way to reach out to someone. You not only show your appreciation for what they've done, but you also demonstrate that you're willing to take the time to write out the message yourself and send it over. For major favors, such as an introduction that led directly to a huge sale, including a small gift may be appropriate – but it's not a requirement. It's a good idea to close by talking about how you look forward to future meetings or conversations with your benefactor. A more formal note or letter might close with “Best wishes,” “Many thanks,” or “Regards,” depending on how well you know the person you're writing. If you're jotting out a simple note or filling in a card, you don't need to use such a structured approach. When someone else sends you a gift – for example, during the holidays – you should certainly respond with a thank-you note. It's also a good idea to keep a list of people who gifted you so that you can reciprocate next year. Such thank-you notes should mention the specific gift you received, how happy you are to have it, and ideally how you plan to use it. For example, if a client sent you a gift card for a local restaurant, you might mention how much you love the food at that place and how you intend to take your husband there for a night away from the kids. Another great time for thank-you notes is a customer's anniversary. If you have a customer who's been buying from you for a full year (or multiple years), be sure to send a note thanking him for being such a loyal customer. Such customers should be encouraged to stay loyal, and they'll certainly appreciate the fact that you noticed how long they'd been with you.